I do not have pierced ears and do not want them but these adaptors are easy to use and allow me to have a wide variety of pierced earring choices because they come in a silver or gold finish. I love the comfort, too, as well as the finish on them because they go with every earring except the post kind. (There are also adaptors for those, too.) So I have increased my choices enormously and people are always complimenting me on my earrings and are surprised when I tell them I do not have pierced ears. I use an ice pick to gently open the tiny loop on the adaptor and then take off the attachment from the earring. Insert the earring link onto the adaptor and close with pliers or another comparable tool. Sometimes it helps to have a pair of tweezers handy to hold the parts. Now I can wear my big earrings again! These converters are good, now I can wear my big earrings again without my earlobe being pulled down. 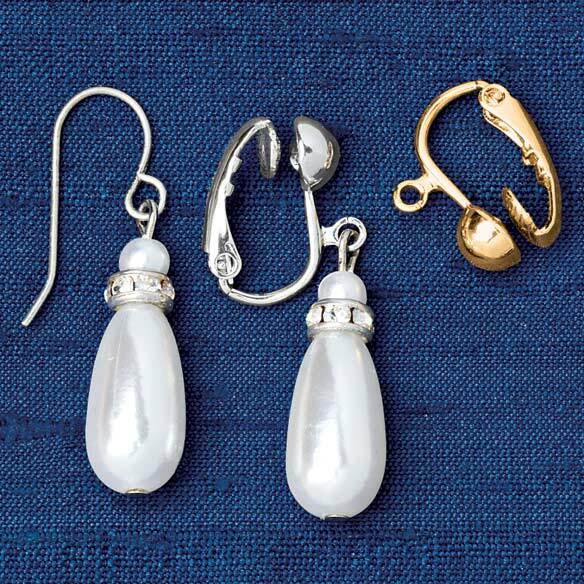 It was pretty easy to attach the fish-hook style earrings with needle-nose pliers. And I am totally satisfied with how nice they look. :) Also, it was easy to adjust the pinch-pressure by widening the distance of the clip part by bending the base back (carefully and very slightly) with pliers. The same with these, they are beautiful and easy to use! Such comfort! They are a GREAT PRODUCT. Perfect Solution for pierced earrings when you don't have pierced ears. Easy to use comfortable to wear. These converters are the best - easy to use, attractive and comfortable. They are hard to find and ordering from Miles Kimball was easy and fast. Have ordered this product before so I knew what I was getting. Same satisfaction as with the first order(s). These are wonderful! I've worn clip-on earrings all my life, and they often are not as modern and attractive as pierced ones. Now I can buy anything I like and convert it to clip-ons (you need needle-nose pliers). I'm ordering more today! I was able to convert pierced earrings to clip ons for my sister. Great idea. They are a GREAT PRODUCT. I wear them every day. I love them in Gold and Silver. My sister does not have pierced ears but often receives earrings for pierced ears as gifts. With the purchase of this nifty product I have been able to convert numerous pairs of her earrings to clip style so that she can wear them. I would purchase more of them in a second. They are very easy to work with. 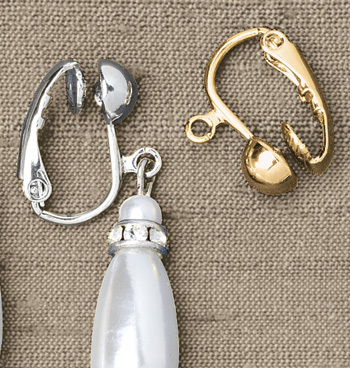 I don't know how many times I have ordered these useful fish hook earring converters! They are the best for adapting pierced earrings into clip style. They are so easy to use - I use an ice pick to carefully open the little round link on the converter, as well as on the earring. I also use a pinch-type tool or pliers to close the links and the job is done. The converters have a shiny gold or silver finish and look fine with all the earrings I have used - probably near a hundred pairs. I have also made some for friends, who are as pleased as I with the result because they do not pinch on the ears; if they do, they can easily be gently pulled apart and that is solved. I have to still convert them but won't have a problem. I didn't think anyone made these and that I'd wasted my money because I wasn't going to have my ears done again. Bought them for my Mom. She never peirced her ears. Hard to find clip earrings. Now she can make her own. Worked great! Easy to convert! I had made earrings for a friend as a Thank You gift. Dismayed to find she didn't have pierced earrings so searched for converters. Am very happy with the way they worked up! Saved the day! The holes in my ears have filled in but I have a lot of fishhook earrings for pierced ears. These work great to convert my fishhook earrings to clip ons. Highly recommend! AFTER SO MANY MONTHS OF HAVING THESE CONVERTERS I FINALLY FIGURED OUT HOW TO CHANGE THEM TO CLIP-ON EARRINGS. A PAIR OF NEEDLE-NOSE PLIERS ARE REQUIRED AND THAT IS ALL. THIS INFORMATION SHOULD BE INCORPORATED ON THE INSTRUCTION CARD THAT IS INCLUDED WITH THE PRODUCT. I AM NOW VERY SATISFIED WITH MY CONVERTERS. I have bought so many of these converters because I don't want to get my ears pierced. I have way too many earrings in my collection t want to get rid of them. Yet, today, so many lovely and beautiful earrings are only available in pierced style. This allows me to be able to wear those, too. The converters work very well. It's a lifesaver when you can't find any clipons. The only difficult part is tightening the dangling part to the new clip on. Really you need a neddlenose plyers to do it correctly. For fish hooks that are too long, cut off excess length before connecting. If the ear ring faces wrong when conncected, use a matching color split ring to connect the ear ring to the converter - this will rotate it 90 degrees, as it hangs down from the converter. While it is beyond my talents to design a converter such as this, I was a little disappointed that the converter already looked like an earring. Adding the fishhook earrings I had was like overkill. The converter was exactly what it claimed to be, and we can in fact convert our fishhook earrings, but they don't look very good together. The silvers don't match and I'm not sure I will be able to use it. They might be okay with other earrings, but not the ones I need to convert. I don't know how one could be designed that would be any better, but I'm just not a fan. I really like the look they give and will probably buy a couple more pairs. They are a little to tight and start to hurt my ear lobes after about 6 to 7 hours, so might not be good for all day wear. No opening to attach earring, without serious, fine workmanship. Can only be used on a single pair. The idea of this product is great but the execution of same is a hassle to perform. It simply does not work unless you have a clear set of instructions to send with the product to me. Both pairs of earrings I wanted to use these for have a distinct front. Therefore, when you hang your earrings on them they face sideways & look ridiculous. I guess they'd work fine with the kind of earrings pictured but not for what I needed. Would be nice if this info was included in the description. Making earrings for Christmas and I think these look nice. first time seeing this I love the idea fantastic!!! I don't have pierced ears, but I like some of the earrings, so I want to convert them so I can wear them. My wife bought them before and wanted more. Hard to find clip earrings. I reviewed several sites and ultimately spoke to each on the phone...easy Comforts had the best online presence and by FAR the most informative, patient phone representative. I will continue to be a customer. We have antique clip-on jewelry and this looks like a suitable solution. So I can wear new earrings. I do not have pierced ears! I do not have pierced ears, but I have fish hook earring to match a necklace I love and want to be able to wear the earring. I needed to convert wire earrings to clip one for someone without pierced ears. It looks like an easy conversion from wires to clip ons. I do not have pierced ears so this is a great alternative. My sister refuses to pierce her ears. I had to buy earrings for her and they did not come in clip. Because I've ordered these before from easy Comforts and I love them! I just lost one of my gold hooks and need to replace it. Great Product! Does this come as a pair? BEST ANSWER: Thank you for your question. It comes as a pair. We hope this information will be of help to you. what color is your gold for the gold converter? is it the color of 14k or a brassier goldtone? BEST ANSWER: Thank you for your question. It is goldtone. We hope this information will be of help to you.